Attorney General Dominic Grieve has said politicians need to "wake up" to the issue of corruption in some minority communities. Mr Grieve told the Daily Telegraph it was not restricted to "any one community" but he was referring mainly to "the Pakistani community". He said it must be made "absolutely clear" that a "favour culture" is unacceptable in Britain. British Asian politicians, including a fellow Tory, criticised the comments. Mr Grieve told the Telegraph he would be "wary of saying" it was just a Pakistani problem, pointing out corruption was found in the "white Anglo-Saxon" community too. But he said some immigrants come to Britain from countries where corruption is "endemic". These are societies "where they have been brought up to believe you can only get certain things through a favour culture," he said. "One of the things you have to make absolutely clear is that is not the case and it's not acceptable." Mr Grieve, Conservative MP for Beaconsfield and the government's chief legal adviser, added: "It is something as politicians we have to wake up to." In a statement to the BBC, he said integration of ethnic minorities in the UK had "delivered great benefits for all of us". On the issue of corruption, he added: "I am absolutely clear that this problem is not attributable to any one community, as I know very well from my many years promoting community cohesion." But the Telegraph says when he was asked if he was referring to the Pakistani community, Mr Grieve said: "Yes, it's mainly the Pakistani community, not the Indian community." Khalid Mahmood, a Labour MP who came to the UK from Pakistan as a child, said the attorney general was marking out the Pakistani community as "more corrupt" than other minority groups. The MP for Birmingham Perry Barr told BBC Radio 5 live that Mr Grieve was trying to "divide and conquer" within communities. His comments were echoed by Lib Dem Qassim Afzal, chairman of the party's Friends of Pakistan group, who criticised what he called Mr Grieve's "loose language". "I'm profoundly disturbed at a statement from such a senior Conservative MP against the British Pakistani community," he told BBC Radio 5 live. And MEP Sajjad Karim, a Conservative colleague of Mr Grieve's, said the intervention would be seen as "purely populist". He told the BBC: "As a member of the British Pakistani community myself, I've found these comments to be offensive [and] divisive." Mr Grieve's warning echoes comments made by Conservative peer Baroness Warsi in 2010. She told the New Statesman magazine there were "at least three seats where we lost, where we didn't gain the seat, based on electoral fraud" and said the problems were "predominantly within the Asian community". BBC political correspondent Ben Wright said electoral fraud was a "particular concern". He said the the issue of corruption in certain communities was "sensitive territory" for politicians, and that the attorney general was "careful to qualify" his comments by saying the problem was not restricted to one minority. 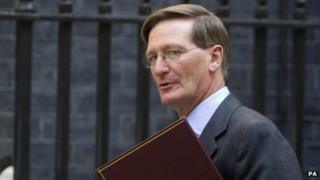 In his interview with the newspaper, Mr Grieve also said he was "very optimistic about the future of the UK". "We have managed integration of minority communities better than most countries in Europe," he said. But he warned the UK's infrastructure could be put under strain if large numbers of people from Romania and Bulgaria come to the country when immigration controls expire in January.